First, we would really like to express the gratitude of our whole family about the calls, letters, emails and posts about Dad. Hearing how he touched those around him has been great. Second, For those of you who read this blog from the Burmese community and are currently looking for work there are positions open at my employer. I’m a recruiter for Ashley Furniture and would love to help you get set up with a position! We have a factory and distribution center in Advance, NC (only about a 35 minute drive from the Triad). Dad cared deeply about helping find jobs for all of his Burmese friends and I too have felt this in my heart. Please feel free to email me at jasonmcmurphy@gmail.com if you would like to learn more about what is available. This pic was taken on January 25th and is the last one we have of dad. 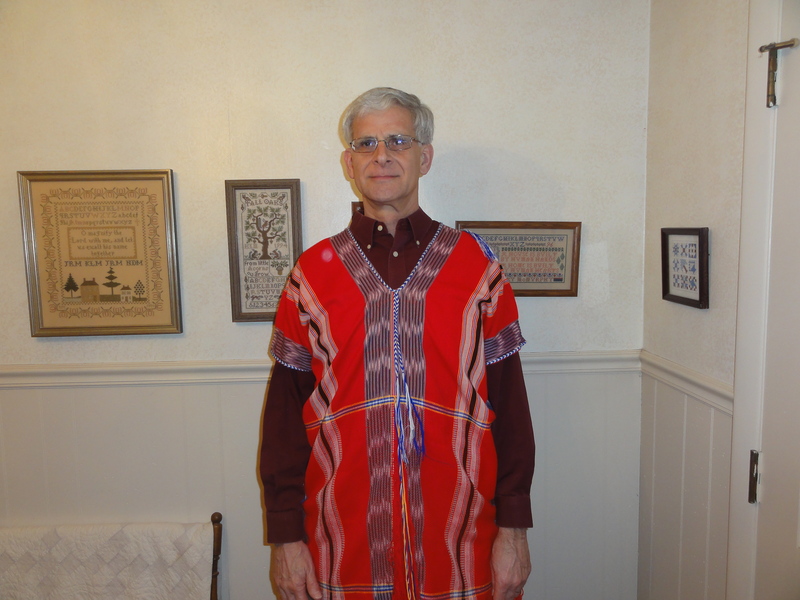 It’s so fitting that it is of him wearing a Burmese shirt that was given to him. If you are able, please join Kay, Nate, Kimberly, Lauren, myself and our family February 5th at 6:30 PM to celebrate the life of my father, John McMurphy. The memorial service will be at First Wesleyan Church in High Point, NC. Visitation will be from 5:00-6:30 at the church as well. Instead of flowers, our family is asking for any financial gifts to be given to First Wesleyan Church and noted for use with the Burmese Pastor Fund. Also, please feel free to continue sending me emails at jasonmcmurphy@gmail.com if you’d like to express how dad was a part of your life. Today, I lost my father. He was known by so many titles. Always at the center of everything that he did was his walk with Christ. His death was very unexpected, tempered by the knowledge that he is in heaven now. We’ll post more details about the memorial service as they are finalized and we get to celebrate his life together. In the mean time if you would like to write a message about how he touched your life, feel free to email me at jasonmcmurphy@gmail.com and I’ll read them to the family. In the past year, Burmese Government had destroy many Christian crosses in chin state, and now they wanted to destroy another cross in Hakha town, capital of the Chin State. I am putting up a link from another blog that shows the Mae La Refugee camp. At the very first of the video, it points out the KKBBSC Bible school that Pastor Sitt Lin and Oo Oo attended. Many of the Burmese families in High Point arrived from this camp. Last spring Meredith came down to High Point for a several month visit. In a real sense she can be considered a grandmother of our congregation. Before she left to return to her home in upstate NY I asked her if she knew of a Karen man who could preach in Karen and Burmese, and who also knew English. She said she knew someone but wasn’t sure where he was at. A week later, after she had returned home she had Sitt Lin Heh call me from Portland, OR. Well she has again been a blessing having just sent a gift of this beautiful Karen shirt. Here is a picture. Thank you Meredith! 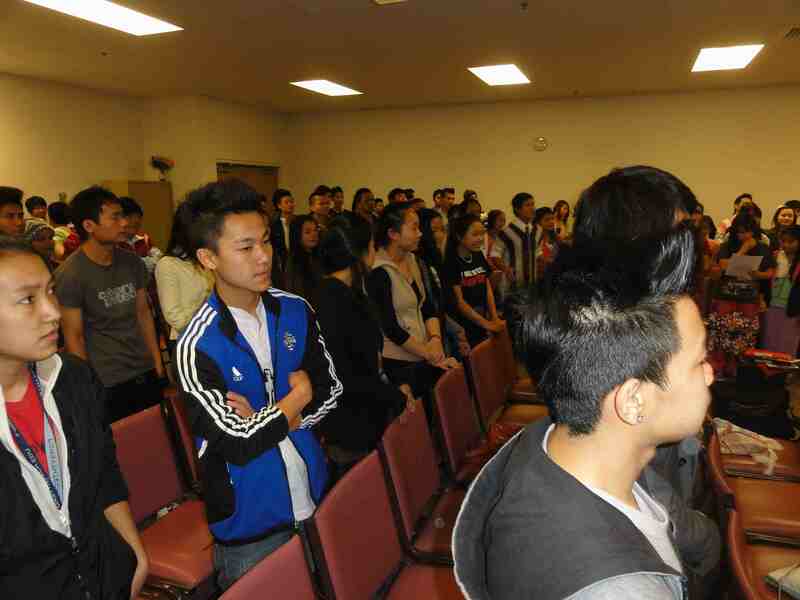 Last Sunday a group of Karenni young people from Winston Salem were a part of our worship service. They sang Our God is Able in English. It was a blessing. Click to hear it. Notice where they were reading the words to the song as needed. Mee Nae and some of his friends from Winston Salem visited church last Sunday. Mee Nae is the son of Peter Wah. His family lived over on Lexington Ave. in High Point for a couple of years. I remember Peter and I volunteering to install some bookshelves in the Carolina Evangelical Divinity library as well as several other projects we did together. It was good to see Peter’s son and ask about his uncle and the rest of his family. Mee Nae is the young man pictured in blue below. You will also see him singing in a related post. Pastor Gentle Crown drove over from Raleigh to lead the congregation in community (pictured on right). 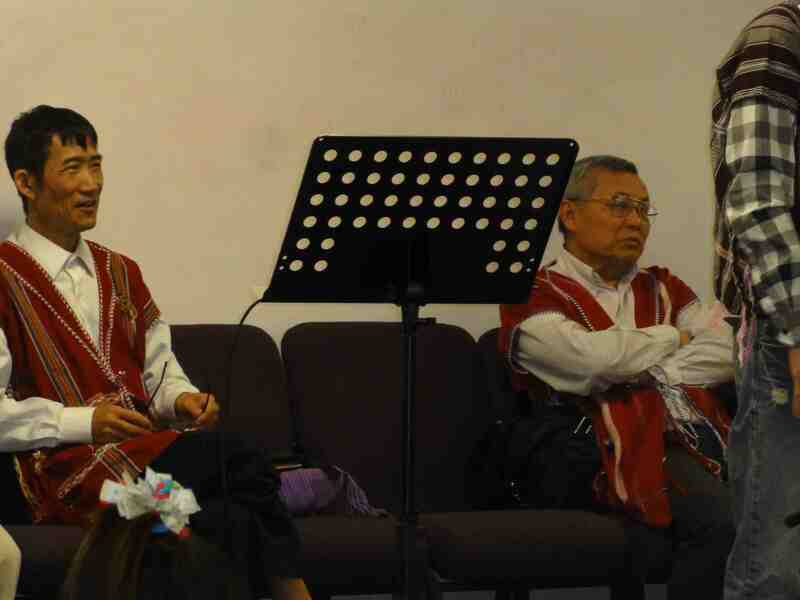 Pastor Htoo Gay (pictured on left) was scheduled to preach the sermon self translating from Karenni back to Karen. 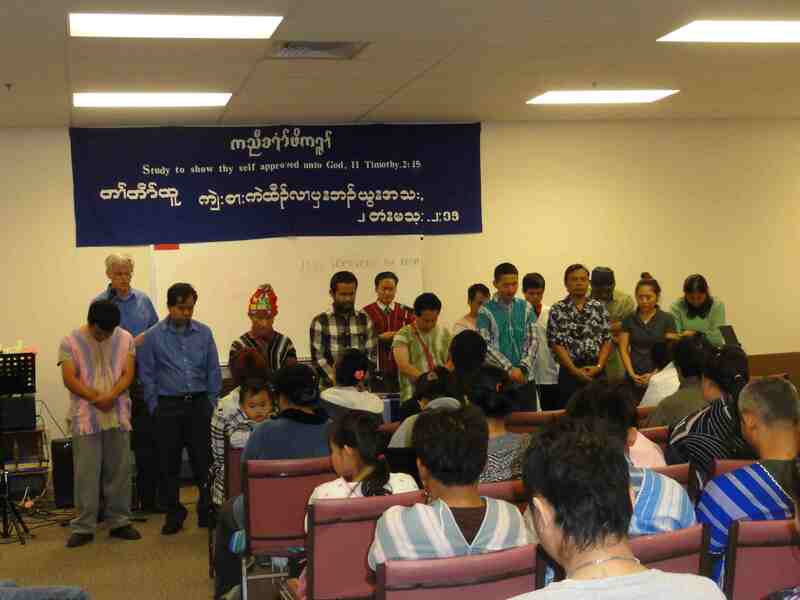 Guests arrived to add to the celebration of our Savior with music (click to hear a guest song by the Karenni youth). Savy emceed the service. Below as a slide show of some of those who were worshipping. The Plai Say Family has arrived. Welcome to America! This week we had the arrival of an extended family of nine. In the picture Plai Say is the father in the back second to the left. His wife, Mu Lu, is beside him. The gentleman (left rear) in the teal Karen shirt speaks English his name is Es Sher, next is No Sher. These two brothers and the the wife Mu Lu are children on Poe Dee the grandmother (lower left). The children (l-r) are Las Ser (14), Doh Blu So (7), Eh Dah (12) and the oldest son Ey Weh (20). 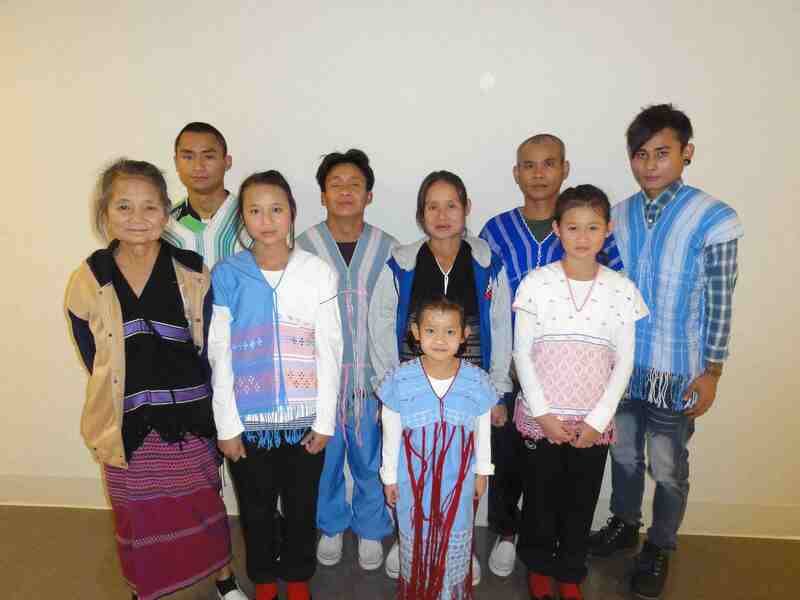 The family speaks Karen Burmese but several could understand some of my English questions. We are so glad they arrived safely after being in the refugee camp for 18 years! As Savy and Paw Kyet are anticipating the arrival of their second child they have been busy. 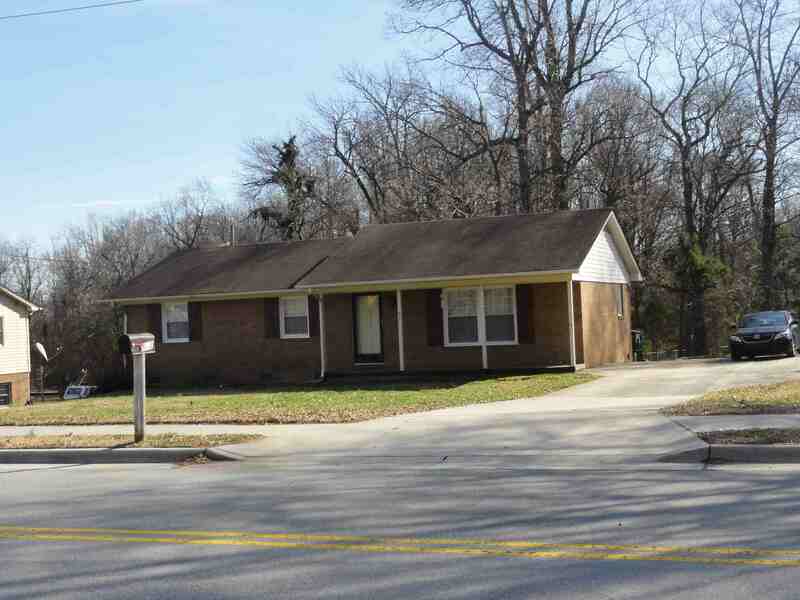 They have bought a home on Oakview Rd and gotten settled in their new quarters. Here is a picture. Paw Kyet says she and her brothers anticipate the arrival of the rest of her family in the next six months. Angel joined the Christmas festivals as her young mother gave birth on 12/28/14. Here are some pix of Angel with mother Mu Wah and also with grandfather, Tun Lway. Mu Wah hopes to see her husband arrive from Thailand soon. This extended family of six responded to the invitation to accept Christ as their Savior about 2 months ago. 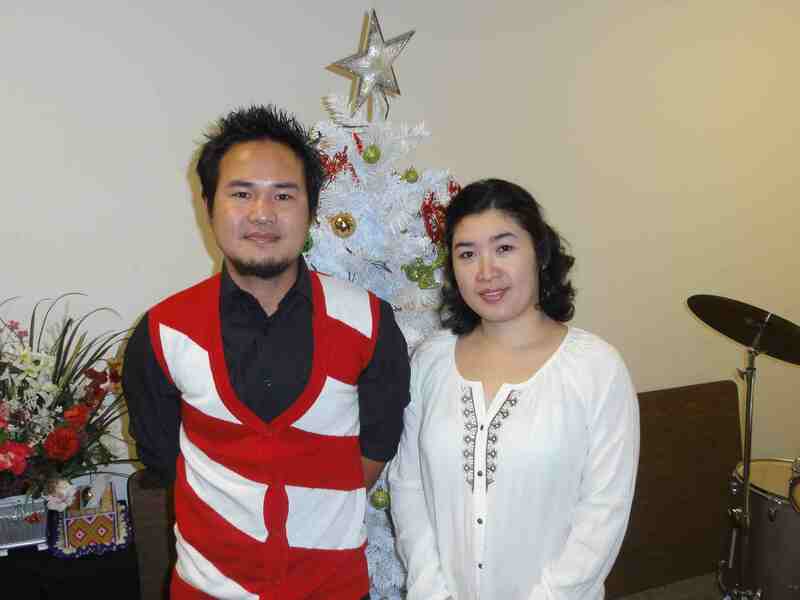 It has been a joy to have K Shaw Wah and Htoo Wah Paw join the Karen congregation in worship for a couple of months. Her e is a picture of this couple. Myamar – you – the next chapter…..